YOU ARE BUYING A 2018 PANINI HONORS CALVIN RIDLEY ROOKIE CARD AUTO # 43/49 ! NICE HIT! 2017 CONTENDERS OPTIC ROOKIE TICKET AUTO OJ HOWARD BUCS. Condition is Brand New. Shipped with USPS First Class Package. 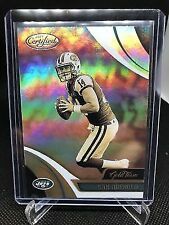 New Listing2018 Select Baker Mayfield Concourse Prizm Silver Rookie Refractor Sharp!!! 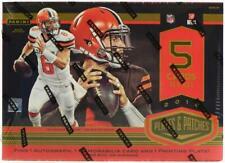 You will be receiving a 2018 Select Baker Mayfield Concourse Refractor Rookie Card Sharp and Mint!! card #30 in the set. 2018 Panini Contenders Derwin James / Minkah Fitzpatrick /25, /49, /175. Condition is Like New. Shipped with USPS First Class Package. CARD IS IN NM/MINT CONDITION. YOU WILL ALWAYS RECEIVE THE EXACT CARD SHOWN. CARD IS IN MINT CONDITION. YOU WILL ALWAYS RECEIVE THE EXACT CARD SHOWN. Jarrad Davis 2017 Donruss Optic #110 Rookie Auto RC /99 Detroit Lions. Condition is Like New. Shipped with USPS First Class Package. 2016 Panini Instant. wins 6th Super Bowl. Panini Instant opens up a new world and a unique opportunity. Base Card #437. Super Bowl 53. This is a VERY limited print run. Get yours now! Get yours Here! 2018 Select Football Mason Rudolph #21/25 Tie-Dye 2 Clr Jersey Patch Steelers. Condition is Brand New. Shipped with USPS First Class Package. Up for sale is a Josh Adams 2018 Panini Absolute Rookie Autograph. Card Number #SS-JA. This card is in Near Mint condition. 2019 Panini Prizm Draft Picks Sam Darnold Stained Glass #93. Condition is Brand New. Shipped with USPS Economy Plain White Envelope. Card will be protected in a penny sleeve, hard plastic top loaded and in a protective bag using a non machinable stamp. Roquan Smith 2018 Panini Prizm Lime Green Pulsar Prizm Refractor RC. Condition is Amazing. Amazing rookie season. Th e co nd it io n of t he c ar d is s ho wn i n th e ph ot os. Fe el f re e to a sk q ue st io ns. Includes a hard plastic top loader. This card contains an authentic autograph of Joe Greene. All my cards are in NrMt to Mint condition, unless otherwise stated. Up for sale is a Will Grier 2019 Panini Prizm Draft Picks Rookie Purple Prizm. Card Number #104. This card is in Near Mint condition. This is a 2018 Joe Flacco Panini Contenders Optic Football “Season Ticket” gold Prizm parallel. The card is serial numbered 02/10 and is in mint condition. It will be shipped in a toploader and bubble mailer. Feel free to ask any questions. Thanks! 2017 Prizm Terrell Suggs Retail Red ONLY 5 PRINTED. Condition is Brand New. Shipped with USPS First Class Package. The item is a 2018 Donruss Football George Kittle #252. Player: Nick Chubb. 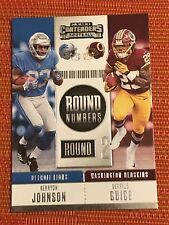 Set: 2018 Donruss Optic. Year: 2018. Team: Cleveland Browns. Item#: 158. Attributes: Rookie. Item Condition: Near Mint/Mint. NICK CHUBB 2018 PANINI ORIGINS RPA RC AUTO/PATCH CLEVELAND BROWNS. See Pictures for details. Item will ship within one day of cleared payment. Item will ship USPS First Class with tracking, in secured padded/bubble envelope. Payment due within 48 hours of item ending, unless other arrangements have been made, or item will be cancelled and relisted. I will combine shipping on mulitple items won on SAME day other auctions end. Please contact me when bidding on multiple items has concluded or wait until days end for invoice. Thanks for looking and please contact me with any questions. Cards pulled from box/case breaks and placed in sleeves and top loaders. 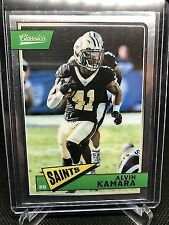 2018 Xr Football Xtreme Rookies Gold Michael Gallup 07/10. Condition is Brand New. Shipped with USPS First Class Package. GREAT CARD HAS SPENT ITS LIFE ENCASED. 2018 Absolute Signature Standouts #SSRE Rashaan Evans - Rookie Card. IF YOU SELECT. This is a Reprint Facsimile Autograph. Select the. Card will be secured in a penny sleeve and holder in a plain envelope. Germaine Pratt 2019 Prizm Draft Picks Autograph Rookie #192. Condition: NM to MT condition. Card will be secured in a penny sleeve and holder in a plain envelope. THIS IS A JOEY BOSA AUTOGRAPH ROOKIE CARD FROM 2016 PRESTIGE "EXTRA POINTS" (#JBO).IT IS NUMBERED 17/25. 2018 Panini Select Sensations Prizm #SE-15 Carson Wentz Philadelphia Eagles Card. Shipped with USPS First Class Package.All cards are freshly ripped from case/box and penny sleeved and put into top loaders for shipment. BUT WITH CONFIDENCE!! 100% SELLER FEEDBACK. PLEASE BE SURE TO CHECK OUT OUR OTHER LISTED ITEMS. WE LIST DAILY AND SHIP LIGHTNING FAST! 2017 National Treasures Rookie COMBO Ryan Switzer John Ross RC JERSEY 47/99. Condition is Like New. Shipped with USPS First Class Package. Great dual jersey card and a decent stash. This is an awesome card! It came straight out of the hanger box and directly into a top loader. It's in mint condition. Sam Darnold 2018 Absolute Football Introductions Spectrum Gold Parallel Card No#IN-SD Feel free to contact me if you have any questions or would like more pictures! Will be shipped in a sleeve and in a custom bubble wrap envelope! Thanks for looking! 2019 Prizm Draft Picks Khalil Hodge RC Auto Silver Prizm. Condition is Brand New. Shipped with USPS First Class Package.